How should politicians prioritize between robust economic growth and solving the problem of climate change? A new report reveals an encouraging answer: There’s no need to choose. The world is set to invest $90 trillion in cities, land use, and energy systems between now and 2030. This investment can continue supporting emissions-intensive infrastructure like coal plants and roadways, or it can finance greener options like renewable energy and safe, affordable public transit. A new report, Better Growth, Better Climate, finds that low-carbon investments – if done right – could cost about the same as conventional infrastructure, but would deliver significantly greater economic, social, and environmental benefits in the long-run. The report was produced by the Global Commission on the Economy and Climate, made up eminent economic leaders—including former Presidents and Finance Ministers—CEOs of multinational companies, and heads of leading economic organizations. It shows that the world now faces an unprecedented opportunity for low-carbon growth. Some countries, cities, and companies are already cost-effectively decreasing their emissions, demonstrating the way forward. The cost of solar technology has halved since 2010, and renewables are increasingly cost-competitive with fossil fuels in a range of countries. There’s increasing evidence of the policies that can deliver growth and emissions reductions. For example, 40 countries and 20 sub-national regions now have carbon-pricing schemes in place, and another 26 are actively considering them. At the same time, emerging evidence shows that global warming may be progressing even faster than previously believed, with the window to avoid dangerous climate change rapidly closing. Communities worldwide are also increasingly realizing the costs of a high-carbon lifestyle. 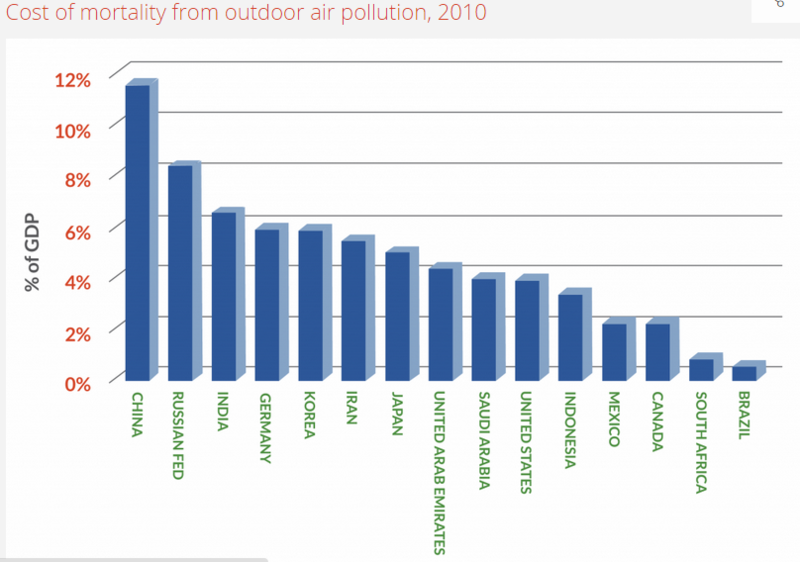 Roughly 7 million people die of air pollution every year. In the 15 countries with the highest greenhouse gas emissions, the health impacts of poor air quality are valued at about 4 percent of GDP—about 10 percent in smog-heavy China. Many of the measures that can help tackle climate change will also reduce air pollution, bringing health benefits to many. In short, we face both unprecedented hazards and unprecedented opportunity. Cities, land use, and energy have perhaps the greatest potential for economic growth over the next 15 years. Yet they also represent the world’s largest sources of greenhouse gas emissions. Our analysis finds that the drivers of growth in these sectors – namely efficiency, innovation, and infrastructure investments– can also drive emissions reductions. One-quarter: Share of agricultural lands that are currently degraded and less productive than they could be. Restoring just 12 percent of these (150 million hectares) into productivity could feed 200 million people by 2030, raise $35-40 billion annually in farm incomes, strengthen climate resilience, and reduce emissions. $170 billion: Net benefits from watershed protection, improved crop yields, and forest products that could be realized each year by starting the restoration of 350 million hectares of lost or degraded forests. This restoration could also sequester 1-3 billion tonnes of CO2e per year. $200 billion: Amount developed countries could save each year by 2030 by reducing food waste, which would also reduce emissions. We’re already seeing the potential of these land-use tactics at the local scale. Farmers in the Maradi and Zinder areas of Niger added nitrogen-fixing trees to 5 million hectares of degraded lands. By doing so, they improved soil fertility, increased crop yields and biodiversity, and more-than-doubled farm incomes. Some leading multinational companies are also seeing the business opportunities associated with more sustainable land use. More than 400 of the world’s largest consumer goods companies have joined forces through the Consumer Goods Forum, and, through their Tropical Forest Alliance, many have committed to deforestation-free palm oil by 2020. These commitments account for well over 50 percent of the trade in palm oil. This has the potential to create a real tipping point in the market. $3 trillion: Urban infrastructure investments that could be saved over the next 15 years if the world’s largest and fastest-growing cities adopted connected and compact rather than sprawled designs. $200 billion: Annual savings that the United States could achieve if it pursued more compact urban growth. For example, citizens in sprawling Houston spend about 14 percent of GDP on transport, compared with 4 percent in smaller, more population-dense Copenhagen. 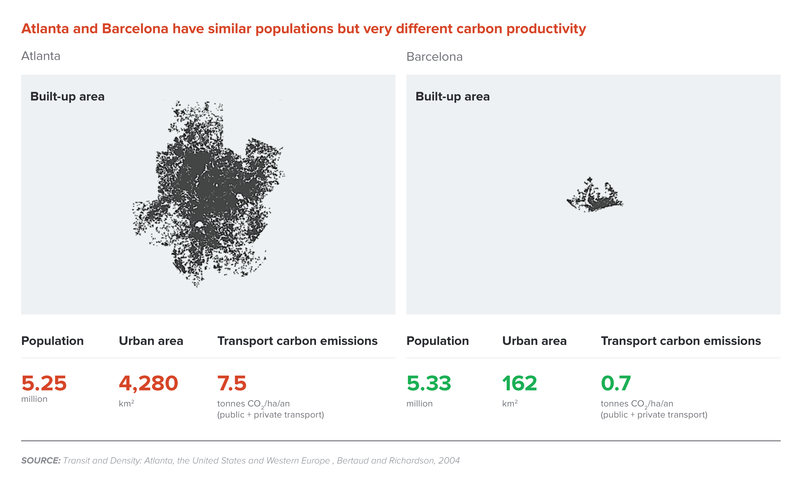 Indeed, the economic and environmental advantages of compact city design can be seen when comparing Barcelona and Atlanta. Both cities house roughly 5 million people. But while Atlanta suffers from urban spawl—covering more than 4,000 square kilometers—Barcelona adopted a compact, 162-kilometer design. Atlanta spews more than 10 times the amount of transport emissions as Barcelona. 40%: Percentage energy demand declined in developed countries over the last four decades due to increased energy efficiency. $5 trillion: Money the world could save by 2030 in reduced fuel expenditures by shifting to a low-carbon energy system, fully offsetting any additional costs. 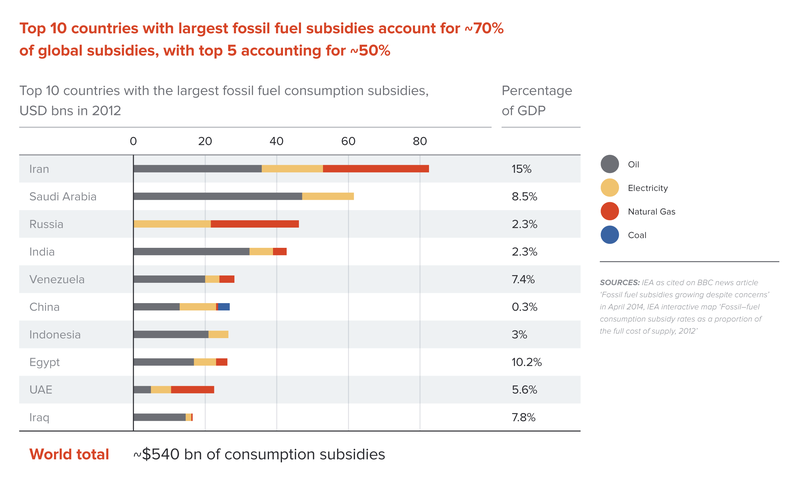 $600 billion: Amount of money currently subsidizing fossil fuel production, exploration, and consumption worldwide, compared with less than $100 billion on renewables. $60-$70/MWh: Cost of coal-fired power in Southeast Asia. Accounting for the damages caused by air pollution, however, adds at least $40/MWh, enough to bridge or exceed the cost gap for alternatives like renewable energy. Some countries are already seeing the economic advantages to wind and solar power. Wind power was the cheapest source of new power at recent auctions in Brazil, as well as in various U.S. States, including Texas. South Africa has procured wind power at costs of up to 30 percent less than those of new coal-fired power. These are just a few of the economic opportunities associated with strong climate action. The Global Commission on the Economy and Climate outlines 10 recommendations that can deliver both economic growth and emissions reductions. Implementing just some these actions could deliver at least 50 and as much as 90 percent of the emissions reductions needed by 2030 to limit global temperature rise to 2 degrees C. Even before considering their climate benefits, these actions could provide net economic benefits. The Global Commissioners are calling on governments, businesses, and citizens to seize the economic opportunities before them. We don’t need to choose between economic growth or climate action. We can, and must, do both together.